Frying Bacon with the Sun – Using a 65-Inch Fresnel Lens to Cook at the Destination Moon Festival. Jonah Levy was one of the folks who put on the Destination Moon Festival (http://destinationmoon.us/about/) this summer, and asked me if I could bring something. While a you can debate the power of solar, the power bacon holds over some people is undeniable. This lens is a spot fresnel and can produce a spot that is between 2000 and 3000 degrees Fahrenheit, provided with direct sunlight! I had a fabricator, my friend Launa Eddy (http://www.launaeddy.com/), build me a frame. She took great care in working with me to make sure it was adjustable, easy to set up and could be easily portable in my car. 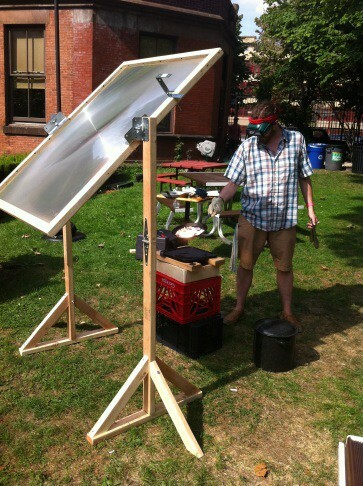 Dale Buchheister (https://www.facebook.com/DecadentDales) was my partner in solar cooking that day, and after we set up and worked out a few things and lit somethings on fire (! ), we were frying bacon. PLEASE NOTE: this is a DANGEROUS thing, and should be treated as a live blow torch if not covered and in direct sunlight. Unless you know what you are doing, you should not try this yourself. We took several precautions: making sure we were positioned in such a way that other would be safe and not wander into the path of the beam, we were serious eye protection, gloves, and had covers for the lens when it was not in use. Truth be told, a Fresnel lens is a bit of an eccentric way to cook things. It is like using a blow torch: way too much heat, way too concentrated. Boiling water or caramelizing sugar, sure. But anything thicker than bacon would be a challenge. Also, any cloud in front of the lens cut the power significantly. That said, the point we were trying to illustrate was made in a jaw dropping way. People were amazed to see that the sun’s energy put into such a DIRECT change. And man, seared bacon? Perfect. We even got a mention in the Wall Street Journal!